Our group of companies is named after an ancient greek word "akron" meaning farthest bounds and highest extreme. Our mission and corporate philosophy since acrons establishment in 1988 has always been to expand the envelope and reach the highest levels of quality delivery and customer satisfaction in our group's businesses of residential development, hospitality, infra-projects construction and retail. Acron Developers has earned a name, even among its peers, for quality construction, superior specifications and punctual delivery. Since 1988, starting with the progenitor Acron Associates, our group has fostered a culture of continuous improvement of its product. Construction guarantees, conforming to accepted codes of practice, are incorporated in the contracts signed with clients. 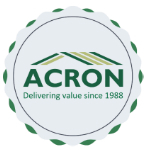 Acron homes are delivered on time and represent excellent value for money.